Chennai Balloon Decorators is a leading and skilled Balloon Decoration Management Company based out in Chennai,Tamilnadu,India. Chennai Balloon Decorators is a leading and skilled Balloon Decoration Management Company based out in Chennai, India. We see ourselves as an epitome of brilliance and Beauty. Chennai Balloon Decorators creates Brilliance at our outstanding innovations, design techniques and Beauty with our overall output. 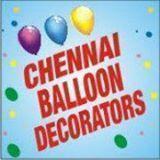 Chennai Balloon Decorators conducts classes in Decorators. It is located in Valasaravakkam, Chennai. It takes Regular Classes- at the Institute.